Save the date: Oct. 29th+30th, Kaiserslautern, Germany. 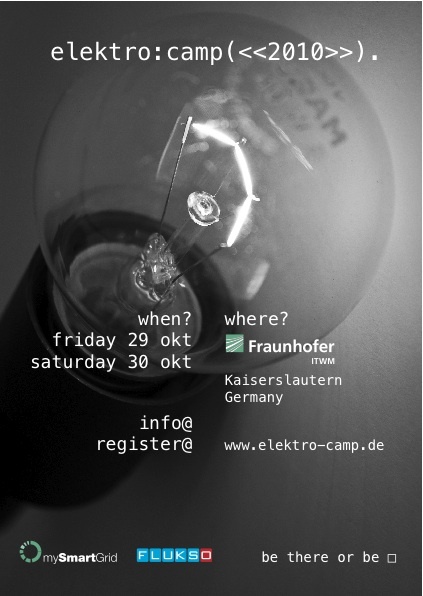 Here's the flyer, please feel free to circulate: Flyer-ElektroCamp. The Camp will be a place for people working on Open-Source Smart Grid technologies. Our goal is to host a barcamp for people to meet, share ideas and collaborate. The conference itself will be a free event, sponsored by the Fraunhofer ITWM. The conference is a BarCamp - (almost) all content will be organized in an ad-hoc fashion. If you're unsure whether a topic is relevant to Smart Grid technologies, please don't hesitate and write an eMail to dalheimer.Ät.itwm.fhg.de. The event will start on Friday, Oct. 29th, around 18:30. We will have a short introduction and initial sessions. On Saturday, Oct. 30th, we will use the whole day for sessions. UPDATE: The schedule is now here: CampSchedule2010.